This introductory module provides an overview of the role and purpose of the Code of Ethics, outlines the professional role and commitment all healthcare professionals share and introduces the social contract and core ethical principles of healthcare that must guide the everyday practice of pharmacists and pharmacy technicians. This module is one in a series of modules that features a variety of learning techniques including – true and false questions, whiteboards, videos, and case studies with reflective discussion – to engage learners from all practice settings and emphasize key concepts from the Code. 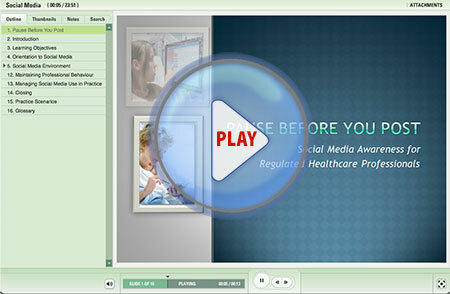 The Video Practice Examples provide pharmacists and pharmacy technicians the opportunity to participate in an interactive learning tool that focuses on a specific ethical dilemma that they may encounter in everyday practice. These practice examples are designed to support pharmacists and pharmacy technicians in understanding and applying the Code of Ethics in everyday practice. Each example illustrates a different ethical dilemma that they may encounter in practice and provides options for their consideration and reflection. 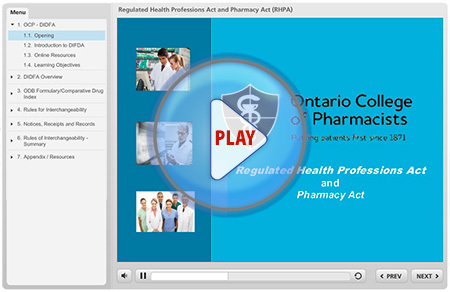 The Regulated Health Professions Act (RHPA) and Pharmacy Act e-Learning module provides an overview of key principles in the RHPA and its related regulations as well as the Pharmacy Act and its regulations. As a regulated healthcare professional, it’s important to not only be aware of the opportunities that social media has to offer but also its inherent risks. Numerous examples and case-based scenarios are included in this module to illustrate social media use in healthcare and to help practitioners reflect on their own use of social media in personal and professional practice.